James Mae Henson was born (October 27, 1927) and raised in Keechi, a community east of Buffalo. His parents were Oscar Wesley and Justine (Hartley) Henson. 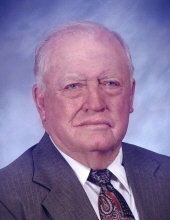 After graduating high school, he attended Sam Houston State College in Huntsville from 1948 until 1952 and, later, received his Masters Degree in 1957. He met his wife, Peggy, who was raised in the Concord Community west of Centerville. She was attending Centerville High School. They met while skating in Centerville. On March 5, 1950, they were married in Keechi. They were married in secret because Peggy was only seventeen years old! In an article once written about the lives of James and Peggy, it was stated that “if there is such a thing as an ‘Education Legacy' it belongs to the Henson Family.” James and Peggy and four of their children are or were involved in education as well as several of the children’s spouses. James Mae Henson passed away in Fairfield, Texas on January 11, 2019 at the age 91 years. His funeral will be held 3 P.M., Sunday, January 13, 2019 Calvary Christian Center near Oakwood, Texas. Pastor Wesley Henson and Pastor Jack Smith will officiate, and burial will follow in the Buffalo City Cemetery. Arrangements are under the direction of Walters' Buffalo Funeral Home in Buffalo, Texas. To send flowers or a remembrance gift to the family of James Mae Henson, please visit our Tribute Store. "Email Address" would like to share the life celebration of James Mae Henson. Click on the "link" to go to share a favorite memory or leave a condolence message for the family.